Benito Mussolini: Mussolini was the fascist dictator of Italy during World War II. He seized power in 1922 and in 1943 because the Italian Army had been losing on all front, even with German assistance, he lost favor and was arrested. Following a daring rescue mission by the German commando Otto Skorzeny, he became Duce of the Italian Social Republic, a German puppet state in Northern Italy. He was executed by firing squad on April 28th, two days before Hitler killed himself. During his dictatorship he called himself Il Duce, which means "The Leader." 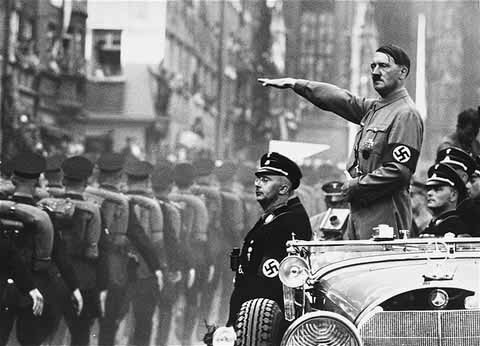 Adolf Hitler: Hitler was the fascist dictator of Germany During the Second World War. He came to power in the 1933. He is well known for his bitterness toward Jews, Slavs, communists, and even some Christians. He was known to the German people as Der Fuhrer. He killed himself on April 30, 1945 in the Fuhrerbunker. Hideki Tojo: Tojo was the fascist Prime Minister of Japan during World War II. Tojo came to power in 1941 as the 40th Prime Minister of Japan. He only served a short 3 and a half years. In 1948 Tojo was hanged for war crimes. Pietro Badoglio: Headed Italy's armed forces, 1925-1940; led Italian government after fall of Mussolini. Shigeyoshi Inouye: Vice Admiral; commanded Japan’s Fourth Fleet, the “South Seas Force”; led Japanese offensive against New Guinea. Wilhelm Keitel: Member of the German General Staff in World War II; chief of staff of German military high command, 1942-1944. Gunther H. Von Kluge: Field marshal; commanded in Poland, France, Russia; part of 1944 plot to kill Hitler; committed suicide. Walther Model: Made field marshal in 1944; commander in chief in West, 1944; committed suicide in 1945. Jisaburo Ozawa: Vice admiral; commanded Japan’s combined fleet in 1945; defeated in battle of Leyte Gulf. Erich Raeder: Grand Admiral of German Navy, 1928-1943;resigned in 1943; sentenced to life in prison after the war. Takeo Takagi: Rear admiral; won battle of Java Sea; commanded in Battle of Coral Sea; killed in Saipan. Tomoyuki Yamashita: General; captured in Singapore in 1941; commanded in Philippines 1943-1945; executed for war crimes. This page was last modified on 10 February 2017, at 12:10.